Downloadable minicomics! There are simply fun little side stories set in the non-dream world, and for 2 bucks a piece you get a PDF file consisting of 9 pages of comics + a cute end page drawing of Ville, so 10 pages all in all. Payment methods available are the usual paypal- or credit card payments, and you'll automatically get an email to download the PDF right away! The story of when Hannu and Ville first met, long before any magical foxes came to disturb their peaceful lives. This prequel comic features 19 year old Hannu, Paju, Hannu's parents and lots and lots of adorable Puppy-Ville. PDF file with 10 pages. 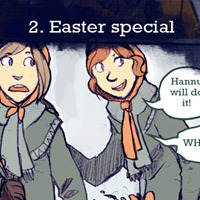 Hannu and his friends partake in the Finnish Easter tradition of "virpominen", where children go from house to house dressed as witches and black cats, giving out decorated willow branches and chanting good-luck charms in exchange for candy. Paju's little brother Tuomi joins in on the fun, and teenage Hannu is not amused. PDF with 10 pages.